Editor's Note: Markets are down significantly today in the wake of escalating trade war tensions between the United States and China. In order to help your protect your investments, I'm sharing Money Morning's stock market crash protection strategy with our readers. Our plan will help you avoid losses – and even profit – as the markets drop. The Dow Jones today dropped 500 points in pre-market trading after China announced new tariffs on 106 American exports. The new tariffs impose a 25% levy on American automobiles, whiskey, and other products. With the new tariffs likely to impact upward of $50 billion in annual U.S. exports, both American farmers and manufacturers are expected to take a significant hit. 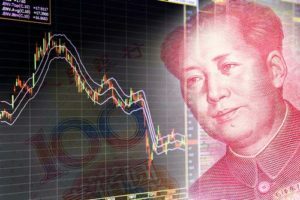 China has not said when these tariffs would go into effect, but the effects were immediately felt in the equities markets, with all major indexes in the red as of this writing. Now here's a closer look at today's most important market events and stocks to watch today. The trade war between the United States and China is accelerating at a breakneck pace, and investors are concerned that this could get even worse. Both the United States and China have offered expansive lists of potential tariff targets. China's new list will include key U.S. exports like planes, automobiles, and soybeans. It also includes a variety of other goods like artificial teeth and flamethrowers. The new list came after the Trump administration listed nearly 1,300 Chinese exports that could face tariffs in response to a long investigation into China's intellectual property violations. Facebook Inc. (Nasdaq: FB) CEO Mark Zuckerberg will testify before Congress on April 11 about the social media giant's unauthorized transfer of user data from Cambridge Analytica. The testimony comes after New York City's comptroller – who oversees the city's pension fund – called on Zuckerberg to relinquish his role as chair of the board. There is good news in the market if you look hard enough today. This morning, ADP/Moody's Analytics said that private companies added 241,000 new jobs to the economy in March. That result easily topped estimates of 205,000 and marked the fifth consecutive month that private payrolls surpassed 200,000 positions. This is solid news for the jobs market ahead of Friday's official March report from the U.S. Labor Department. Money Morning Liquidity Specialist Lee Adler has been warning investors about problems at the U.S. Federal Reserve and the U.S. Treasury. The mismanagement of public spending combined with huge changes in tax policy is creating major problems in the bond markets and stock market. Now, with a liquidity crisis on deck, a death spiral could begin in the market at any minute. Here's what you need to know, and how to protect yourself moving forward. Shares of Boeing Co. (NYSE: BA) are off more than 4.1% thanks to the latest round of tariffs from China. Tariffs are weighing on the U.S. aviation and automotive industries this morning. China has been a major purchaser of Boeing airplanes in recent years. However, tariffs could drive buyers to purchase more planes from the company's key rival, Airbus, in the future. Shares of Lennar Corp. (NYSE: LEN) are in focus as the home builder prepares to release quarterly earnings on Wednesday. Shares added 0.7% after the firm reported earnings per share of $1.11. That figure was well above the average Wall Street estimate of $0.77 per share. The company also topped revenue estimates thanks to strong order volume and an uptick in the price of the average home. Shares of Spotify Technology SA (NYSE: SPOT) popped more than 13% in its debut on the markets. The streaming music giant listed on the New York Stock Exchange without a traditional initial public offering. Amazon.com Inc. (Nasdaq: AMZN) is now off more than 13% over the last few weeks thanks to an ongoing spat with U.S. President Donald Trump. The White House has publicly demanded action against the company over its tax practices. Look for additional earnings reports from CarMax Inc. (NYSE: KMX), Acuity Brands Inc. (NYSE: AYI), Ollie's Bargain Outlet Holdings Inc. (Nasdaq: OLLI), JA Solar Holdings Co. Ltd. (Nasdaq: JASO), Quantum Corp. (NYSE: QTM), and Franklin Covey Co. (NYSE: FC). "Trouble Is Brewing": According to Bloomberg's latest report, America could be heading for an economic disaster that would rival the Great Recession. Billionaire Ray Dalio's hedge fund – Bridgewater Associates – has made a $22 billion bet against the market. And Citibank calls our present situation "eerily reminiscent of the mortgage crisis." To see why we believe some of the richest players in the world are preparing for a market collapse, click here.